Mistyped words. I’m sure you’ve spotted these problems in your own work – the incorrect word that Word doesn’t underline because it is still a word and somehow is not grammatically incorrect. It might be that you typed able instead of table or a spoon instead of sponge. These aren’t the mistakes that Word feels the need to flag, but they aren’t what you meant to say and your ear will hear them. Repeated words. Sometimes, especially when I’m writing a piece of nonfiction, I use the same word, or a version of this word 3 or 4 times in a single paragraph. When I was writing about Pearl Harbor, sometimes it was unavoidable. There really wasn’t a substitute for Navy although I did have to get creative in the paragraph about a particular telegraph message. Using the word message three times in four sentences was just too much and my ear picked up on it right away. Spots that just go on . . . In addition to repeating single words, sometimes I give a particular chunk of information two or three different ways in just a paragraph or two. When I spot these mistakes, I’m never sure what I was trying to do. Did I cobble together two paragraphs and simply not cut enough? Maybe I was trying to emphasize something. Whatever caused the problem, when my ear hears the information a second, or sadly third, time, it notices and I know it’s time to cut. If you haven’t tried reading your work out loud, give it a shot. I know it sounds like a huge task but I do it even when I’m working on a book. That’s no big deal when I’m writing a 500 word picture book, but for a 14,500 word piece of young adult nonfiction, it can be a drag, but I also find all the odd, rough bits and have a chance to smooth them out before my editor or a potential agent sees them. Sue--I ALWAYS read aloud my work before I bring it to my critique group and before I submit it. The brain is an incredible thing. When a word is missing, if we only read it (silently, in our heads),the brain slips the missing word in... without the fingers tapping the word in. But, if we read it aloud, we hear what is missing and then can insert the missing word. Thanks. It's good to know there is another crazy one like me who reads their stuff out loud in our quest to make it the best it can be. Sue, great advice on editing your work. 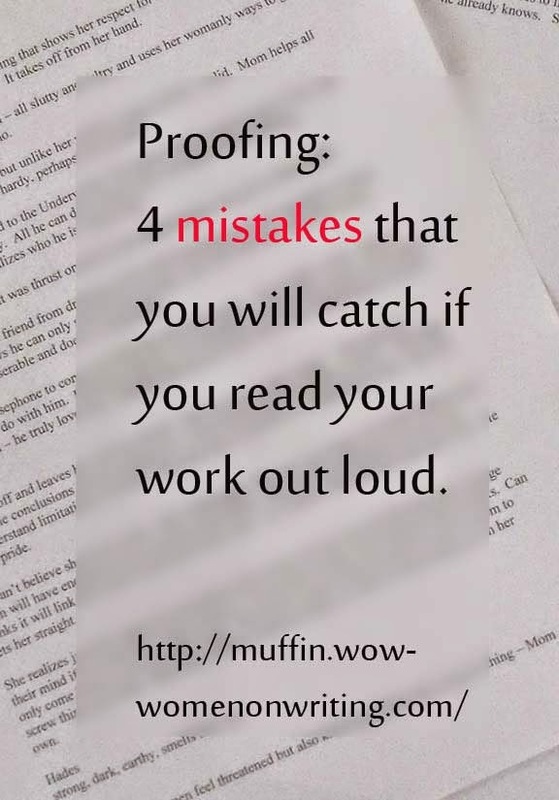 It's so easy to miss things as your reading over your manuscript. Reading it aloud does help. I have to admit, I can't read my own work aloud. I start out fine, but then end up mumbling and then just reading it in my head. I use a Word application called Speak. I just started reading my novel that I'm trying to get published (fingers crossed) and it's been a huge help. Definitely true. Thanks for sharing. Writing is an aural fascination. It's not about the look on the page as much as it is how it charms the ear. I have always read my work out loud. It is my first rule. It is much easier to discover lumps and faults in rhythm, not to mention the advantages of proofing that you wrote about. Shakespeare wrote words that were to be spoken out loud and the practice certainly didn't hurt his art. It's difficult to imagine him hacking it out and not saying each line out loud. Drama aside, it is an excellent practice for the discerning writer. In writing, the eye can easily deceive. But not the ear, particular once it is trained to listen. I think that could be the difference between great writing and, well, all the other. Love this post. I love to read aloud and record myself on my IPhone. I've recorded dozens of important scenes from my writing. Then, I play it back and get the full effect. I have caught so many little mistakes....the wrong word here or there, an awkward sentence, an ineffective adjective. I can always improve the dialogue after I listen to the recordings. Thanks for your suggestions.